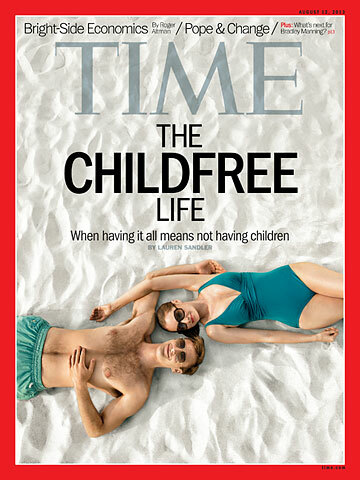 Time's piece on childless women: Interesting, but where are the child-free men? Where Are the Men in Child-Free Trend Pieces? Sometimes, it takes two to not make a baby. Statisticians measure a woman’s childbearing years as spanning from ages 15 to 44—a bracket that might change as fertility protocols advance but that for now means it’s far easier to label a woman of a certain age childless than a man, who might become a first-time father at 65. Both culturally and academically, “childlessness defaults to women, in all scholarship in the social sciences,” says Pamela Smock, of the Population Studies Center at the University of Michigan. But it seems highly unrealistic to assume first-time fatherhood is in the cards for the majority of childless 65-year-old men, so the absence of men in this discussion (a problem I’ve contributed to) is probably about something more than simple biological differences. More likely, it’s a product of the ongoing discomfort with talking about the way that men’s choices help shape women’s lives, for good or for ill. Unfortunately, leaving men out of the discussion means ignoring the possibility that many men also want to live child-free lives, making it easier for women to make that choice themselves. When I was younger and would raise the possibility of never having kids, I was routinely and gravely warned not just that I would change my mind but that I would do so because it was supposedly impossible to find a man who wouldn’t want children. The assumption that lifelong childlessness was just a girlish fancy that would be ground out of me by the realities of heterosexual adulthood was so pervasive that often it didn’t need to be stated directly—it was just implicit in the casual toss-off of that infuriating phrase, “You’ll change your mind.” But I haven’t, and there are plenty of good, decent men out there who simply don’t ever want to have children, either. Perhaps feminism and the breakdown of traditional gender roles have liberated men, too, and the belief that you have to be a father to consider yourself a grown man is fading. But since no one bothers to ask men, it’s hard to say for certain.